I signed up for another Alpine Club trip, this one leaving from Mt. Washington at 8am. But after my snowless Christmas on the east coast, I was determined to visit winter here at home, logistics be damned. I wasn’t sure how I was going to manage the 3 hour drive on winter roads with my junky old car. And I always have trouble sleeping the night before trips. I always FEEL pretty good, so I’m not sure what that is about. Excitement? Nerves? Luckily carpool magic happened and I only had to drive myself to the nearby park n ride. My insomnia got me up at 4:00 am, but that was six uninterrupted hours of sleep. Cannot complain. After a long dark ride (sunrise at 8:10am near Mt. Washington), we made it to Raven Lodge in 2.5 hours. No traffic! This trip was also an intro to backcountry winter travel and we took some time to look at the island avalanche warnings and weather. I also learned how to put on and use an avalanche transceiver for the first time. I think many people snowshoe up Mt. Elma without transceivers, but I believe it is club policy to have everyone wear one on all winter trips. I was told by someone with more experience than I, that it is very rare but not unheard of to experience avalanches in the Helen McKenzie Lake area. So better safe than sorry. After we got the safety preparations settled, we were off! The park sign covered in snow. 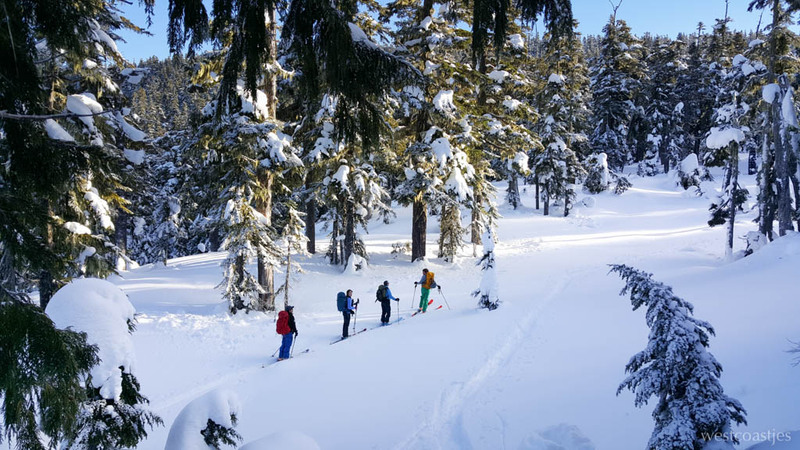 It was a mix of folks on skis and snowshoes. I was on snowshoes. Part of the learning here for me was watching people backcountry ski. Before this trip, I really didn’t understand why bother with all that equipment when walking is just fine. Then I got it … skis are SO fast! I felt like I was working hard to keep up with their very casual pace. We reached Helen McKenzie Lake and decided it was sufficiently frozen to travel across. On the left is Mt. Elma. On the right is Mt. Brooks, another popular & easy winter trip. After the lake, we found the base of the mountain. Then we started going up. It’s about a 300m elevation gain from the lake. The one perk of snowshoes, it’s easy going up! Even easier than hiking in boots in the summer, as you an pick wherever you want to go. We stopped to test the snow on the way up. The avalanche bulletin is for the entire island, so it’s important to test snow on the slopes you are going to travel on (especially for the skiers I believe). The whiskey jacks came out to play. It also gave the newbies (like me) a taste of what we will learn in Avalanche Skills Training courses. The snow was incredibly stable, even better than the avalanche bulletin reported for the island as a whole. So off we went to finish the summit of Mt. Elma. I went off to scope out Mt. Albert Edward. Then it was time to head back. The skiers were quite excited for the downhill part, and joked that they’d see us snowshoers back at the lodge. Honestly though, we were only a few minutes behind them. And with the time it took them to take their skins off and on, I think it was almost even. I could see how they would be way far ahead of us on a bigger mountain though. Mt. Washington ski resort from a frozen Helen McKenzie lake. Honestly, it made me want to try skiing again! Maybe work my way up to this backcountry skiing thing. Someone said the slopes they were doing on the way down were black diamond level. They were wearing helmets, weaving in between trees on steep slopes. I need a little practice before I try that…. haven’t skied in over 10 years! We got back around 3pm and headed for a beer in nearby Cumberland. I was home in time for dinner. Another great trip with the Alpine Club! Feeling so grateful that I FINALLY joined.